If you're a regular reader of The Green Miles, you know my feelings on Dominion Virginia Power. Since 1996, Dominion has contributed more than $5 million to Virginia political candidates and committees. Our reliance on increasingly expensive, dirty coal power is a failure to our community and a violation of Arlington values – economically, environmentally, and from a public health perspective. As an activist who’s spent years lobbying and organizing for clean energy and climate action here in Virginia, I’ve seen firsthand how Dominion’s huge financial power works to keep our energy policies locked into the status quo at a time when we desperately need a new direction. As Virginia confronts the threat of climate change and our dependence on dirty, polluting energy sources, we need leaders who will think big and fight the special interests that block progress towards a clean energy future. Dominion Virginian Power was the top business donor to Virginia politicians in 2008, contributing nearly twice as much as the runner-up, the tobacco company Altria. Their influence has gone unchallenged for years, allowing them to serve as the dominant force in policy decisions – consistently weighting the scales against clean energy and a cleaner Virginia. The stakes are too high to let that continue. Therefore I, Miles Grant, Democratic candidate for House of Delegates in Virginia’s 47th district, pledge that I will not accept contributions or gifts from Dominion Resources, its subsidiaries or its employees, either as a candidate or as an elected official. If I ever mistakenly accept such a contribution, I pledge to give it to a clean energy or environmental nonprofit as soon as the error is discovered. I take this pledge not as a statement about Dominion's right to exist or its employees, but as a promise to consider only the public interest as we move Virginia's energy policies forward. I know we can’t move Virginia’s energy policies into the 21st century without working to engage Dominion as a partner. I’m always happy to sit down and talk to Dominion. But I’m not interested in its financial backing. Learn more about my campaign at MilesGrant2009.com. The Arlington County Board passed a budget last night that increases the real estate tax rate 2.7 cents and restores some unpopular proposed cuts. Board members increased the general fund operating budget by $5.4 million over the one for this fiscal year to $946.8 million, officials said. The rate increase will bump the average homeowner's property tax bill from $4,501 to $4,551, based on a new rate of 87.5 cents for every $100 of assessed value, county officials said. Board members reversed a plan to demolish the Gulf Branch Nature Center and partially or completely restored library hours for three branches. But recreation centers' hours and other services were scaled back, and officials cut 95 positions countywide. All of those employees have found other county jobs or taken voluntary severance packages, officials said. Congratulations to the thousands of Arlingtonians who rallied to save Gulf Branch! In particular, watch the coal-state Democrats, led by Virginia's Rick Boucher, who are pressuring Waxman to weaken the short-term emissions targets, so that coal-heavy utilities will have more time to develop carbon-capture technology and be able to compete with renewable power. It's not that they're necessarily worried the targets for emission cuts by 2020 are unrealistic on some macro level. Rather, they're worried that the coal industry will play only a tiny role in a low-carbon future if it's not given ample time to adjust. The flipside, of course, is that most climate scientists don't think we have time to dally around. As a ratepayer, I don't think we have time to dally around, either. Dominion Virginia Power raised our rates 18 percent in September, 1.5 percent in January and now wants to raise them another 7 percent, all in large part due to higher coal prices and the huge cost of building new coal-fired power plants. Who's Rep. Boucher really looking out for -- coal states? Or corporate coal polluters? On Saturday, I dropped off a yard sign at a supporter's home on George Mason Drive (his dog, Paco, came out to supervise). Andrew has solar panels that provide most of his home's electricity, even watching his electric meter spin backwards on sunny summer days. He's planning to add a few more to try to get off of Dominion's coal-fired power as much as possible. And of course, don't forget the Honda Civic Hybrid in the driveway. If you'd like a Miles Grant for Delegate yard sign, email us! For my day job with the National Wildlife Federation, I live-blogged Friday's House Energy & Commerce Committee hearings on the Waxman-Markey clean energy bill, the American Clean Energy and Security Act of 2009. Must-Read: "Industry Ignored Its Scientists on Climate"
I always figured Big Oil and Big Tobacco shared a similar smokescreen. But this article is stunning confirmation. Check out this CNN story tracking food from an organic farm in Washington, VA to a farmers market in Washington, DC! To find a farmers market near you, visit WashingtonPost.com's interactive farmers market map. This is not a criticism of Terry McAuliffe or his campaign. This is a criticism of the Virginia political establishment that gives credit to the "winner" of the sign wars at the Shad Planking. Can't we let candidates impress us with other things? Like, say, their positions on issues? I'm certainly not claiming total innocence on this one -- my campaign for House of Delegates has ordered yard signs of its own. Our goal was to order just 500 yard signs (most shops have a 1,000-sign minimum and we have no use for that many) that were printed on recycled material (and were ultimately recyclable) and printed in a union shop. But we weren't able to find a shop that could meet all of our needs , so we had to settle for the smaller order printed in a union shop. 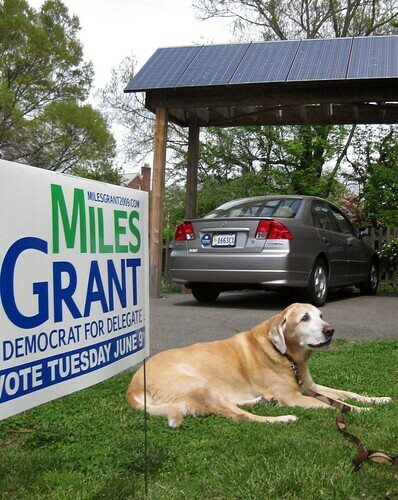 If you live in the 47th district and want Miles Grant for Delegate yard sign, email me! More MG09 schwag can be found at our CafePress store. 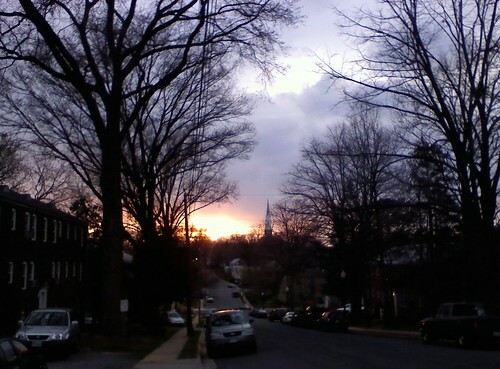 Recent reports warn that Virginia and Maryland (among other states) are running out of power and may face rolling blackouts as early as 2011. At the same time Congress and the new Administration have vowed to address climate change, which could make it harder to build new power plants. Can technology help get us out of this jam? How? Which technologies should we be funding? The "recent reports" is actually one report, and it was produced in an attempt to justify Dominion Virginia Power's new $1.4 billion transmission line. And President Obama's climate & energy plans would only make it more expensive to build new fossil fuel-based power plants. NRECA knows President Obama wants to make solar and wind power plentiful and affordable -- a major threat to its coal interests, so they're trying to focus on "technology" -- translation, "clean" coal. The public is invited to an Arlington Energy Town Hall Meeting to discuss how the nation ensures we have the power we need in the future. WAMU’s Kojo Nnamdi will moderate a panel discussion and public Q&A. In case you were wondering, the "Alliance to Save Energy" is a virtual who's who of big polluters, from ExxonMobil to Dow Chemicals. 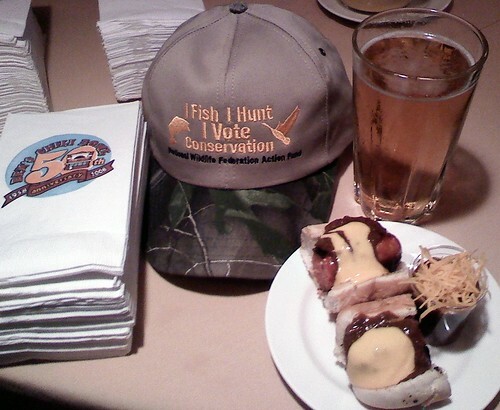 Just got home from a fundraiser for the National Wildlife Federation Action Fund. It took place at Ben's Next Door, the new upscale companion to DC icon Ben's Chili Bowl. Continuing the Scene from the Sidewalk series, here's a beautiful star magnolia I passed in Lyon Park while canvassing for my campaign. 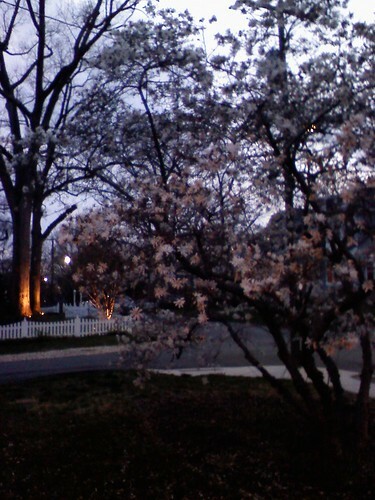 I only wish I could post the smell -- the blossoms made the whole block smell like fresh flowers. Busy day here at Miles Grant for Delegate Campaign HQ -- just taught The Green Mom to play Wii Tennis, now we're hoping the rain ends in time for this afternoon's canvass. MACA, which represents agribusinesses like Monsanto, Dow AgroSciences and DuPont Crop Protection, is rather less thrilled about the fact that no chemicals will be used to grow the crops. The group is worried that the decision may give consumers the wrong impression about conventionally grown food. Talk about setting up a straw-man argument. Who says a garden is supposed to be your family's only source of food? Don't have time to garden? 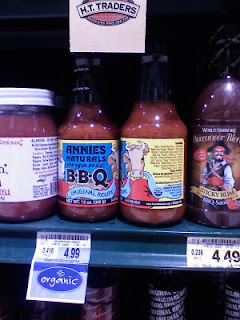 Who says you have to -- shop at a farmers market or buy organic at the grocery store. Once victory gardens were a sign of patriotism. Now agribusiness wants you to think they're a sign of weakness. Really makes you wonder whose best interests they're looking out for. UPDATE 4/13: OK, well, it WAS a cool video, but now YouTube says it has been "removed by user." Want to make anyone involved in Arlington County government visibly uncomfortable? Bring up the proposal to close Gulf Branch Nature Center. Both County Board members and county employees get very defensive at the mere mention of Gulf Branch. THUMBS DOWN: To those county officials who have yet to offer a cogent explanation for why Gulf Branch Nature Center is about to be closed. Clearly, it’s not about money. The less than $150,000 budgeted for the facility is peanuts in a spending package that tiptoes up to $1 billion. There are plenty of ways to find that money, and much more, in the crevices of the county manager’s proposed spending plan. If it’s not about money, what is the reason? The argument that there’s a nature center nearby doesn’t wash with us; that facility, Potomac Overlook Regional Park, is a fine place, but is operated by the Northern Virginia Regional Park Authority, which has no specific duty to Arlingtonians. Comparing Gulf Branch and Potomac Overlook is like comparing apples and oranges. Barring a better explanation, we don’t know why County Board members would move forward with the proposal to close the nature center at this point. I have no inside knowledge of discussions on Gulf Branch, so this is complete speculation. But it was surprising that county first proposed not just temporarily closing or cutting back at Gulf Branch but demolishing it. That leap made it hard not to get the impression, as the Sun Gazette and many others have, that some in county government may not be so sad to see Gulf Branch go. If that's the case, the county should've just said "Gulf Branch doesn't fit our long-term plans, period." That would've involved taking a small public relations hit, but now the county is setting itself up for a much bigger hit from the nearly 3,000 people who are rallying to save Gulf Branch. Roanoke Times Rips "McDonnell's Single-Minded Focus on Coal, Oil and Other Fossil Fuels"
McDonnell needs to realize that if Virginia wants to become the energy capital of America, the commonwealth must look to the future of renewable energy. The state simply doesn't have huge reserves of fossil fuels. Take coal, for example. The National Mining Association estimates that Virginia has about 770 million tons of recoverable coal. Compare that to the 17.6 billion tons in West Virginia, or the 75 billion tons in Wyoming. Oil is perhaps worse. In an online chart of proven reserves published by the U.S. Department of Energy, Virginia doesn't even merit an entry. Even if the most optimistic estimates of offshore reserves prove accurate, Virginia would be a minor player. Check out the coal and oil reserve maps at ShowUSA. Even states like Iowa and Alabama have better shot at being the "coal capital" than Virginia. And forget about oil -- Virginia vanishes from the top 25 altogether. Now look at the renewable energy map. The first thing you notice is that renewable resources are much more equitably spread among the states than fossil fuel deposits. The next thing is that while Virginia ranks 18th on the list, it's not a distant 18th -- and as a tech leader, Virginia is in much better position to take full advantage of the resources we have than other states ahead of us on the list. And if we do take advantage of Virginia's clean energy resources, we can create jobs, lower consumers' energy bills and preserve our planet. Every Democratic candidate -- Creigh Deeds, Terry McAuliffe, and Brian Moran -- understands this. Bob McDonnell doesn't get it. We need to make sure voters know that in November. I think of that quote every time I hear about how our continued dependence on coal-fired power is hurting consumers and businesses and leaving Virginians in the dark. Dominion said incremental increases proposed for Sept. 1 and Jan. 1 will pay for operating costs, power plants in Buckingham and Wise counties and conservation programs. The increase also includes a 13.5 percent profit for the company and its investors. At a time when Virginia businesses are laying off workers, Dominion is asking them to divert more money away from their payrolls and towards Dominion's payroll and profit. The proposed 7 percent hike would be on top of the 18 percent rate increase we just got hit with in September. Oddly, the Washington Post article doesn't mention the 1.5 percent fee Dominion quietly added in January to cover the cost of the new $2 billion coal-fired power plant in Wise County. Compounding the rate hikes, it would be more than a 28 percent total increase. But surely our elected officials will take a stand for consumers ... right? Gov. Timothy M. Kaine (D), who does not have a formal role in reviewing the request, said Dominion officials informed him they would be seeking an increase. "The SCC is a strong body with a great staff, and I think they will do due diligence on this," he said. "It's difficult because the cost of energy is going up." Wow. Dominion wants to raise customers' energy bills more than 28 percent in the worst economy since the Great Depression, and all Gov. Kaine can muster is a shrugging "well, what're ya gonna do"? Our continuing dependence on dirty coal is taking money out of consumers' pockets, costing Virginia jobs, stripping our natural resources, polluting our air, and warming our planet. Remember that the next time anyone tries to tell you we can't switch to clean energy.